One of our oldest ongoing projects just got a serious facelift. 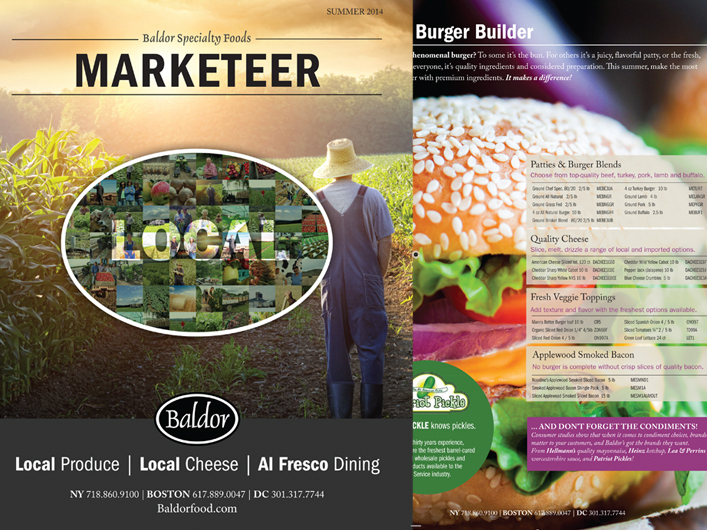 The Marketeer, Baldor Specialty Foods’ quarterly magazine/ newsletter has been a passion project for Solar Jet Pro for nearly 7 years, and has already gone through 2 redevelopment cycles. Baldor’s new Marketing and Business Development Director, Benjamin Walker, had visions to take it further than its previous iteration, wanting to align more to the content and design style of the well-regarding food magazine Edible Manhattan. We scrapped the previous magazine template entirely, and set to work defining a brand new set of brand standards, including logos, typography, fonts, color, icons and imagery. The revitalized Marketeer is pretty awesome. And classy! The new print guys know their stuff.